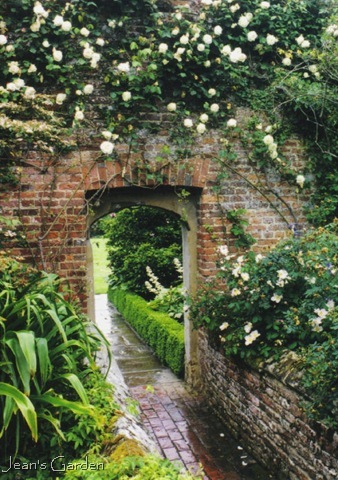 Sissinghurst is the very famous garden of Vita Sackville-West and Harold Nicholson in Kent, England. 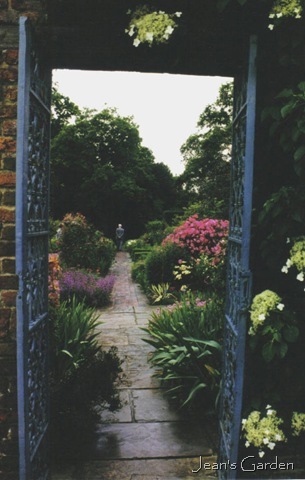 When I visited Sissinghurst in early June of 2000, I was just developing an interest in gardening. I had heard of Vita Sackville-West, but had not yet read any of her wonderful newspaper columns on gardening. I knew that Sissinghurst was famous, but I didn’t know what it was famous for. I don’t remember which of my friends advised me to visit Sissinghurst, but she must have really impressed on me that it was a “must-see” garden because I went to quite a lot of trouble to get there. Nevertheless, even as I got off the Chunnel train from Paris to London in Maidstone, used a public call box at the rail station to find a B&B where I could spend a couple of nights, and set off the next morning in the rain to take the bus to Sissinghurst and walk the last mile or so along a muddy footpath to Sissinghurst Castle (wishing all the while that I had chosen different footwear! ), I had no preconceived notions of what I would find there or what I should be paying special attention to. When I look back at my photographs from that visit, though, I see that I was very taken with the “garden room” concept for which Sissinghurst is famous, and which is very apparent in views from the writing tower (see photo at top of page). I especially loved the gateways from one room to the next. 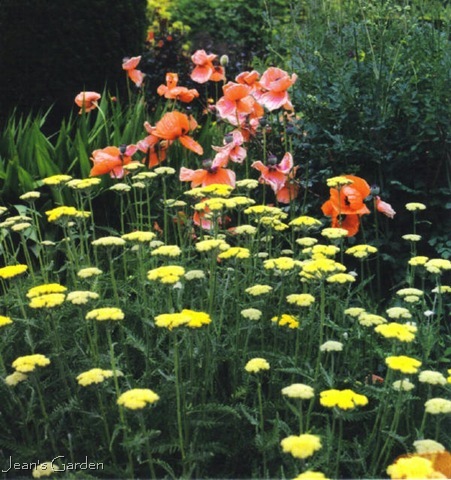 and charmed by plant and color combinations like these orange poppies and yellow Achillea. And, of course, I spent considerable time exploring the famous white garden. I think what I most loved about my visit to Sissinghurst, though, was the discovery of new plants or of new uses for familiar plants. Before I went to Sissinghurst, I had no idea that rosemary could be grown as anything other than a small annual herb; the idea of rosemary hedges was mind-blowing. And it was at Sissinghurst that I fell in love with Astrantia, a plant that I had never seen or heard of before, but which I made a point of finding and planting in my own garden. Sissinghurst Castle Garden is operated by the National Trust. While the estate is open to the public every day of the week, year round, the garden is open only from mid-March to mid-October, Fridays through Tuesdays. 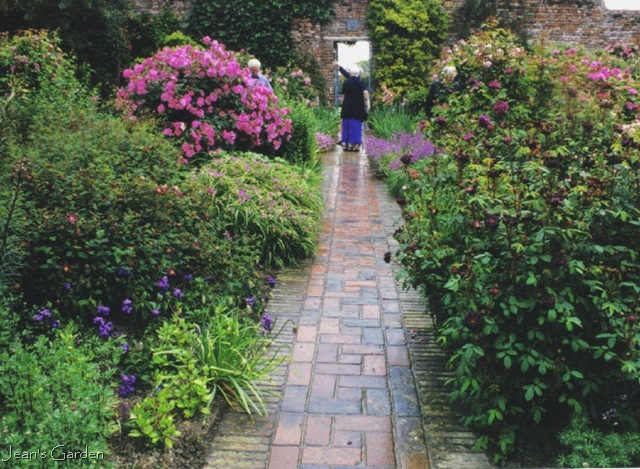 Sissinghurst is accessible by public transport if you don’t mind a bit of a walk. (Wear good shoes for muddy conditions.) But, however, you get there, this is very definitely a garden worth visiting! Jean, this was the garden that started it all for me. Unlike you I had read so much about it, read her books, and visiting it became a MUST! My pilgrimage also was exhausting, when visiting by public transit, there is no easy way, but so, so worth it. I visited in September and remember being blown away by a sheet of cyclamen flowering under a tree, I had never seen them before. And there was so much colour for September, in Canada (20 years ago), most people just gave up on gardening in the fall. I learned so much from Sissinghurst. Loved it also – if anyone else is based in London and wants to visit without the hassle, Evan Evans tours ran a bus day trip when I was there. It started out of Victoria station and was very reasonably priced, visiting this garden and Great Comp, also in Kent, equally worth a visit. My chief memory is of the ten foot tall delphiniums – it was another world! Cyndy, Thanks so much for the information about the tour from Victoria Station — and also for cluing me in about Great Comp. Seeing this has made me want to do more research and learn more about this beautiful place….thanks for the inspiration!! Also in reading kilbournegrove’s comment….I am thinking that I too could learn alot for what is offered at Sissinghurst!! Stan, It’s hard for me to imagine anyone with even a vague interest in gardening who wouldn’t both learn something new and be inspired by Sissinghurst. Stunning pictures, thank you for the tour. I want to go! One of these days. Rebecca and Shyrlene, I’m glad you enjoyed the tour. Jess, I think every gardener should get a look at English gardens if at all possible — and Sissinghurst is justly famous. I want to go back one of these days! Noelle, This posts on English gardens makes me yearn to go back, too. It’s been ten years since I was last in England. Astrantia are amazing plants. They don’t look like much in the mail order catalogs, or at the nurseries; but in the flower beds, wow! Dear Jean, Sissinghurst, the genius of the place. There is no other garden in England, in my view, which has been so visited, so written about, so pictured, so copied, so talked about and, possibly, so admired and, indeed, so deserving of such attention. I have grown up with this garden. From the last years of Lady Nicolson, during the excellent stewardship of the ‘Sissinghurst Girls’ [PS and SK who I am pleased to have been able to call friends], and the tenure of The National Trust. 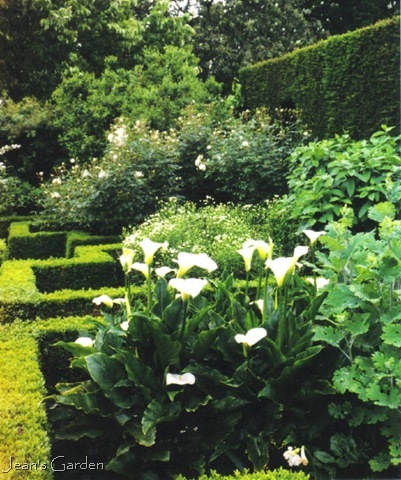 In every phase of the garden’s development, and of my own gardening, Sissinghurst has always informed and provided both inspiration and great plantsmanship. Sissinghurst is an iconic garden in terms of its design, its artistry of planting, its timeless beauty, its resonance with the senses, and its powerful atmospheric quality. It is an outstanding legacy to the Nation. Edith, How wonderful to grow up with this marvelous garden and to be able to visit it repeatedly and in many seasons and moods. I wonder if anyone has ever visited Sissinghurst and not fallen in love with it. Yes. It was ‘too’ popular then. Lovely article Jean. I’ve always been fond of Sissinghurst. I’d love to go back now that I garden more seriously than before. Aren’t rosemary hedges wonderful? I have a plan for a rosemary hedge here behind the vegetable gardens. The bees just go crazy for the lovely purple flowers in spring. How delightful for you to live in a climate where you can actually have rosemary hedges. Alas, rosemary isn’t hardy in Maine, so there are no rosemary hedges in my future. There are many other plants from Sissinghurst (like those Astrantia) that I can grow, however. Like Deborah, I had done a lot of reading about Sissinghurst and the Nicolsons. My first visit was like a religious pilgrimage ( I actually had palpitations!). That was in July 1989 and the Purple Border was at its best and a few years later I visited in early Spring and was t able to see the Lime Walk decked out with its wonderful planting of small bulbs. it is a very inspiring and moving place to visit and perhaps the most influential garden of the last century. I visited Sissinghurst with my family when I was about eight years old, quite a few years ago now! I really wish I could travel back in time to appreciate what I saw with adult eyes, although I do remember thinking it was very beautiful even as a child. Barry and Heidi, I’m finding it so interesting to learn about others’ experiences of Sissinghurst, and yours seem to be at opposite ends of a spectrum. Barry, I love your description of this as a religious pilgrimage; I think that’s what it would have been for the friend who advised me to go. Perhaps I was taking her religious pilgrimage for her, which make the trials of public transportation and uncertain lodging somehow fitting. Oh Jean this is a garden I long to visit. I fell in love with Vita many years ago… introduced through Virginia W. … her gardens are so inspirational as is her story. It sounds like you went through an ordeal to get there… your photos are wonderful … I love the room aspect and the entrances from one to another are enchanting. The views from the tower are great too! What a pretty garden it seemed to be. The orange poppies, achilleas, pathways, very impressive indeed. Thanks for sharing with us. If i ever went to england, will visit for sure. This story was nothing short of inspiring, Jean, kudos! The efforts you made just to get to it, even though your interest in gardening had not caught fire yet, is a tribute to your strength of will, a characteristic I highly admire. So glad that the garden was worth it! I also hope to see it, someday. That goes for you, too, Carol. It would be wonderful for you to visit this garden that you already know so much about. Frances and Carol, I seem to have given the impression that getting to Sissinghurst was more of an ordeal than it actually was. I love to travel alone, and I like to use public transportation, so I’m used to (and actually enjoy) the challenge of figuring out how to get where I want to go by public transport (more of a challenge in some countries than in others). The only part of this that could have been truly an ordeal was the lodging aspect. Normally, I would have used the Book a Bed Ahead service of the wonderful British Tourist Information Centers to make a reservation for a B&B or hotel in Maidstone. But because I was coming there direct from two weeks wandering around in France, I hadn’t had access to that system. It was more than a bit of a shock to step off the train from Paris in the evening and find myself at a largely deserted rail station with no open Tourist Information Center, just a short list of B&Bs tacked up at the public call box (which was refreshingly absent the prostitute adverts that decorate public telephones in London). I think the first two I called may have had no vacancy, and I was starting to feel distinctly panicky when I called the third. I will be forever grateful to the woman who was trying to take a break from paying customers, but who agreed to take me in. I hope I was a relatively trouble-free guest. Frances, Thank you so much for transforming the personality characteristic that I usually think of as the vice of stubbornness into the virtue of strength of will. I feel like a better person already! I was at Sissinghurst recently for a lecture. Sadly the gardens were closed, so I will have to return at some point in the near future. Jean, what a wonderful place to visit! I went years ago on my trip to see the great gardens of England, and the biggest surprise for me at Sissinghurst was how much I loved the White Garden; I had pooh-poohed the concept previously but happily ate my words. 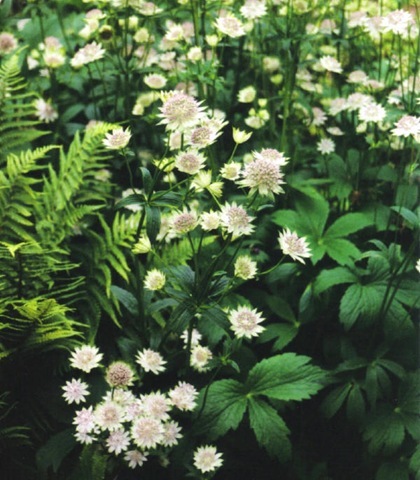 My love affair with Astrantia began at Great Comp, a private/semi-public garden open through the National Gardens Scheme. I grow a couple of kinds in my DC area garden although they struggle with the heat. Barbara, Do go. I don’t think even the best photos can really do justice to the whole experience of Sissinghurst. Melissa, Thanks for reminding me that, although I can’t grow rosemary hedges, there are many wonderful plants like Astrantia, Delphinium, Aruncus and many varieties of Geranium that I can grow precisely because they love my cool Maine conditions. I can only dream of seeing Sissinghurst, Jean, but it’s fun to see it through your eyes (and through a book I have about it, and thru Vita S-W’s garden books). It’s soooo good to see you and others giddy over Astrantia. I think it’s a much underutilized perennial and should be admired, adored, and planted far more often. Jodi, Keep dreaming and maybe you’ll get there someday. When I fell in love with Astrantia at Sissinghurst, I had no idea that it would be so difficult to find after I got home. Do you think the reason it’s underutilized is that it doesn’t do well in the heat of many U.S. gardens and therefore the big wholesale plant suppliers don’t bother with it? In recent years, I have noticed more Astrantia available at local nurseries here, but it seems to be fancy new colors rather than the beautiful, old-fashioned white and pink. I have seen photos of Sissinghurst and thought it must be an exceptionally beautiful place. But photos can sometimes deceive. It is good to hear that it is worth the trouble of walking through mud to get there! Your pictures are lovely. There is much to learn from an iconic garden like this one. Deb, Sissinghurst is, if anything, more beautiful than its photos; it’s an icon for good reason. And I agree that there is always something new to learn from such an iconic garden. Jack, Thanks for the link. Please do put together your own post; I would love to hear (and see) more about your experience of Sissinghurst. In fact, I think this is such a great idea that I’m going to issue an invitation for others to also share their Sissinghurst experiences. Hi Jean~~ It was years ago when I read Ms. Sackville-West’s works. I know she made impressions but they’re so much a part of me now I can’t recall specifics. English gardens are such grand affairs with ample hardscape and mature trees and shrubs for structure. I can’t imagine having such a spread and a posy of hired help to maintain my creation. But I’d sure like to try…. Grace, your comment about the scale of English gardens reminded me of a scene reported by Jim Dodson in Beautiful Madness. He encounters a somewhat overbearing English garden designer at the Chelsea Flower Show who interrogates him about his plans for his garden, proclaims those plans very ambitious, and asks him how big his staff is. When he explains that his only “staff” consists of his two dogs, she is aghast! But, of course, we know from our UK garden blogging friends that most of them garden on the same scale and with the same number of staff that we do. Wow, I so enjoyed visiting vicariously this outstanding garden … it would definitely be on my list of places to visit if I made it over there again. Great photos! I just popped in to say thanks for visiting my Mosaic Monday ‘Pink in the Garden’ post. Thanks for your lovely comment and I’m glad you enjoyed the viewing. Thanks for stopping by to visit, Bernie. PS We only got to Holland briefly but never made it to England…can you believe it?!?! Thought I’d already done this, but I think the mountain air in Canada has got to me!! Next on my places to go! nice photos and blog! thanks! i want to go tomorrow! I know what you mean, Nadia; I wouldn’t mind going back tomorrow! What an extraordinary place. Your photos really captured its beauty wonderfully. Thanks so much for visiting and for your comment. 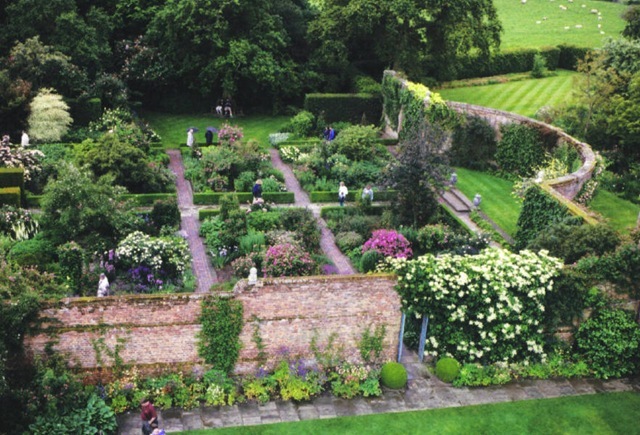 Have you been to Sissinghurst?